Deciding between Keurig’s K50 and K200 is more than a choice between two coffee makers. It’s a choice in philosophy. It’s about old versus new. It’s about simple versus less simple. It’s about a steady past versus an uncertain future. In essence, choosing between the two is the very conflict of life. Or, it’s just whether one model of coffee maker does a better job than another. It’s really up to you. It is true that the K50 and the K200 were both the lead-in models of their respective coffee maker lines. The K50 is classic Keurig, and all it does is brew coffee. The K200 is Keurig 2.0, and it was designed as a response to criticism over the environmental footprint of Keurig’s non-biodegradable K-cup pods and to give users options in brew strength. Doing that required tradeoffs in design, but in the end we think they were worth it enough to give the K200 the nod. One of the tradeoffs the K200 made was that it is only compatible with Keurig’s 2.0 pods. This limited performance by limiting the variety of roasters and flavors it will brew. However, it has an option allowing users to brew a stronger cup of coffee, and a special accessory to brew a whole carafe of coffee. Even though we love the idea of using the same machine to brew coffee for breakfast and make a nice chai in the afternoon, we prefer being able to brew a stronger cup of coffee in the morning, or a carafe of it if someone is hosting a brunch. Neither machine has a very clear advantage in price. The margin you find today might also be tomorrow’s margin but swung to the other model. Both machines are made largely of plastic, so don’t try bashing them with baseball bats to see if they’ll withstand it. You’ll be out a lot of money for no good reason. But this is also a tossup. It’s hard to hate the Keurig, but its environmental footprint certainly gave us significant pause. We were happy to hear that the company had taken steps to give its customers ways to use it and not have it hang on their conscience. The K50, on the other hand, is just a classic design that brews good coffee at the push of a button. We have to go with au courant and the K200. Keurig’s classic design is intended to do just one thing: make hot drinks. 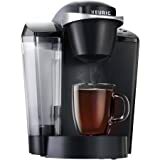 It offers hundreds of flavors from dozens of brands and can get you a steaming hot cup of coffee in less than a minute. Keurig rebooted itself with the K200. It is compatible with 2.0 pods, which means it’s more eco-friendly. It also has an attractive touchscreen control and offers a variety of brew strengths. When we started comparing these two, we checked out reviews for both models online. That way, we could get a comprehensive look at how people feel about these coffee makers. We do that because we recognize that we have biases and that getting a much broader picture is the best way to serve people. We checked Internet reviews, and now we report our findings. Both coffee makers are very popular. We could pick nits about both of them and make it look like the negatives are a really big deal. Truthfully, for most people, both the K50 and the K200 are pleasurable experiences. People like them because they both brew good coffee. The features and negatives fade into the background when a product does its basic job in a way that satisfies its users. People who bought the K50 liked that it just brewed coffee quickly and offered a wide range of brands and flavors. There was some noise involved that some users didn’t particularly care for, but there’s little disputing that the K50 brews a mean cup of joe, or chai, or hot chocolate. The K200 is popular for the same basic reasons, but some users liked that it was now possible to brew an entire carafe of coffee at once, and that you could choose a regular-strength brew or a stronger one. That variety means that you can brew either a cup for yourself or coffee for all. Of course, to do that you need a Keurig-sold accessory. This, and the K200’s incompatibility with older style of K-cup pods, were the chief complaints customers had about it. Generally, people were happy with the K200 because it did its job. Those individual hiccups aside, the general consensus was that both models of Keurig coffee makers are great values for their price. They do the job they were purchased for, which is to make great coffee easily available. It’s not always true that newer is better, but in this case it is. Keurig’s K200 has a sleek touchscreen display and offers the ability to choose brew strength. It also represents an effort to address criticism about the ecological footprint of the company’s non-biodegradable K-cup pods. That is not to take anything away from the K50’s fast brewing that offers a massive variety of coffee flavors and brands. Both of them are great coffee makers, and both of them are really very affordable. Those things being equal, we have to go with the K200.